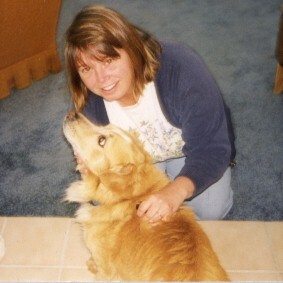 Here is Susan with our dog, Cookie, who we had with us from 1991 to 1999. Cookie was the first and only dog I've ever had. He was a good dog and lots of fun to have around. He was part basset hound and part golden retriever, and looked sort of like a golden retriever with his legs chopped off at the knees.